Few cities offer a more immersive experience into the past than the walled city of Dubrovnik on the southern coast of Croatia. 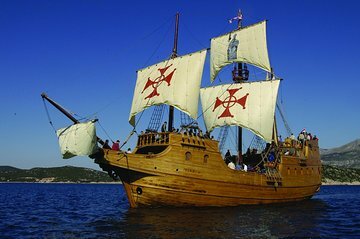 With its thick medieval walls, massive gates and soaring battlements, Dubrovnik transports visitors back to a time when the fortified city was a major maritime power commanding the third-largest navy in the Mediterranean. 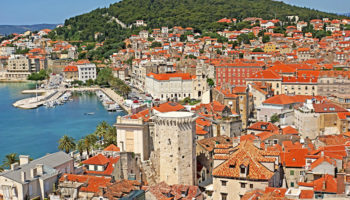 The beautifully preserved city has long been the country’s star tourist destination, and it’s garnering even more attention today as a filming location for the popular HBO series “Game of Thrones.” Fans of history and fantasy alike will delight in all the sights and attractions in Dubrovnik, and the nearby beaches and islands offer ample opportunities for fun in the sun too. Even a short visit to Dubrovnik makes it easy to understand why the city is nicknamed the Pearl of the Adriatic. Located in the eastern section of Dubrovnik, the Old Port is protected by two breakwaters: the Porporela, built in 1873, and the much older Kaše, which was built in 1485 from massive stones piled on wooden foundations. In Dubrovnik’s seafaring heyday, forts were constructed around the perimeter of the harbor to guard the city’s ships. 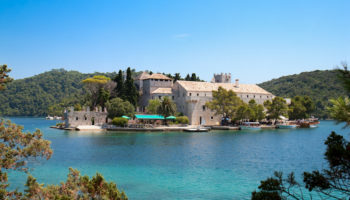 Today, the Old Port is both a tourist attraction and a departure point for cruises to the beaches on nearby Lokrum Island. 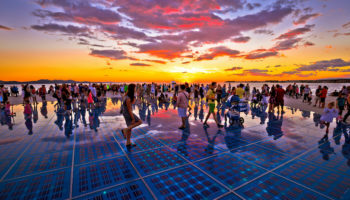 With its scenic views and built-in benches, the breakwater Porporela is a popular place to take an evening stroll and watch the sun disappear over the Adriatic Sea. Banje Beach is the closest beach to the Old Town, which makes it the most convenient beach and the beach with the best views of Dubrovnik’s walls. The island of Lokrum can also bee seen. Part of this pebbled beach requires an entrance fee, but there is also a public part, which is always livelier and more relaxed. It’s a great way to beat the heat after some sightseeing in the Old Town. Activities here include beach volleyball, mini football or water polo. You can also enjoy lying on deck chair and having a drink. Located near the Pile Gate at Stradun’s west end, the Franciscan monastery is home to the oldest still-operating pharmacy in Europe. While most of the church’s original construction was destroyed during the 1667 earthquake, the Romanesque cloister and gardens that greet visitors are much the same as they were 500 years ago. An ornately carved portal crafted in 1498 is on display as well. Treasures from the monastery’s collection of rare books and art objects are exhibited in a large Renaissance hall. Herbal lotions and potions made from centuries-old recipes are available for purchase from the 14th-century pharmacy. During the 15th century, Dubrovnik took steps to ensure that the city had a supply of fresh water by building an aqueduct system connected to a spring in nearby Šumet. Master builder Onofrio Giordano della Cava was entrusted with the task. Two fountains bearing the architect’s name mark the end points of the aqueduct system. The more impressive of the two is the 16-sided Big Onofrio Fountain, which stands on the Stradun in front of St. Savior church. Topped by a large cupola made by Milanese artist Peta Martinov, the fountain still provides cold and clear water to thirsty visitors. The busiest entrance to Dubrovnik’s walled Old Town is Pile Gate, which is actually two gates in one. Built in 1537, the outer gate features an arch built into a semi-circular fortification. Ornamented by a statue of St. Blaise, the city’s patron saint, the 15th-century inner gate leads visitors to the Stradun. The drawbridge before the double gate is no longer pulled up at night with winches and counterweights. Nowadays, the gates stand open 24/7. Locals dressed in period costume sometimes pose as guards for photo opportunities. 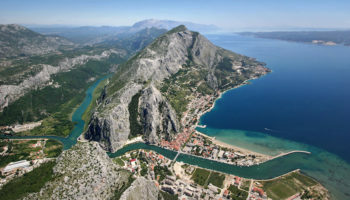 Situated on a towering rock overlooking the Adriatic Sea, Lovrijenac was constructed as a detached fortress to repel attackers from both land and sea. The original structure dates back to at least 1301. Its triangle shape and staggered terraces were built to accommodate the shape of the rock. The fortress was so impenetrable that it could be held by a 25-man garrison. 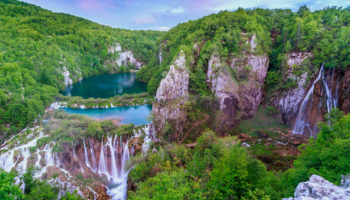 Today, Lovrijenac is a popular attraction in Dubrovnik and plays host to a variety of cultural events, from the world series of cliff diving to local productions of Shakespeare’s Hamlet. It also served as a backdrop in some of the most memorable scenes from the “Game of Thrones” series. In addition to serving as the home to the Rector of the Republic during his term of office, the Rector’s Palace was also a meeting place for the city’s governing bodies, an armory, a prison and the local lock-up. 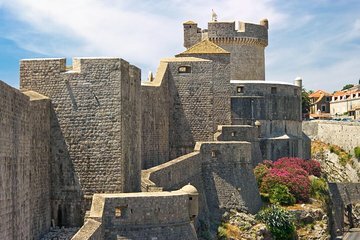 Like other structures in Dubrovnik, the original medieval palace has been rebuilt several times over the centuries. The palace is notable in that it manages to blend Gothic, Renaissance and Baroque elements into a unified whole. Now home to the Cultural History Museum, the Rector’s Palace has been decorated with period furnishings to recreate the styles of the original rooms. The best way to enjoy a panoramic view of Dubrovnik’s ancient city is by gliding to the top of Mount Srdj on an ultramodern cable car. Located just outside the city walls, the cable car station offers visitors a quick, easy and scenic mode of transport to the peak of the rugged little mountain. In addition to a restaurant, snack bar and souvenir shop at the summit, there’s a small museum and memorial commemorating the Homeland War of the 1990s as well. Hikers may enjoy descending the mountain by way of a steep ropeway trail. Much of Dubrovnik was destroyed by an earthquake in 1667, but reconstruction gave the prosperous city the chance to rebuild with an organized scheme. The rows of baroque homes and shops that line Dubrovnik’s main thoroughfare are a lasting result of this careful planning. Running through the center of the Old Town, Stradun is a beautiful street where visitors can shop for souvenirs, enjoy an ice cream at a sidewalk café or join the locals for the traditional evening stroll. Many of the city’s monuments are located on the Stradun too, including the landmark 15th-century bell tower at the end of the Stradun in Luža Square. 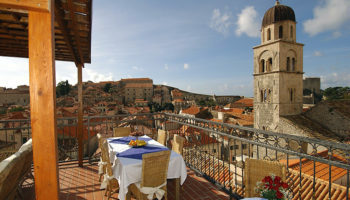 Walking along the top of the city’s medieval walls is a highlight of any stay in Dubrovnik. The walls encircle the entire Old Town quarter and take at least an hour to explore. Most of the walls were constructed during the 13th century but have been reinforced over the years to withstand repeated attacks. A series of imposing towers intended to protect the city against the Turks, were added in the 15th century. Fans of the TV series “Game of Thrones” will recognize sections used as settings for the show’s capital city of King’s Landing. 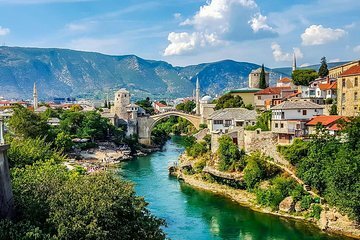 Standing 25 meters (80 feet) high in some places and up to 6 meters (20 feet) thick in others, the walls are an awesome sight in their own right, but the views that they offer of the town, the harbor and of the Adriatic Sea are simply spectacular.